As I pay more attention to the surrounding, observing and trying to recall what it was like just few years ago, it is shocking just how much has changed in barely a decade. Previously, I blogged about how Forfar House and the old flats at Dawson were still standing nearly a decade ago but today replaced by new and upcoming premium housing. When I read about some commemorative bronze sculptures at the site of the old Simon Road market, I feared for the worst. Clearly the word "commemorative" does tell you something. 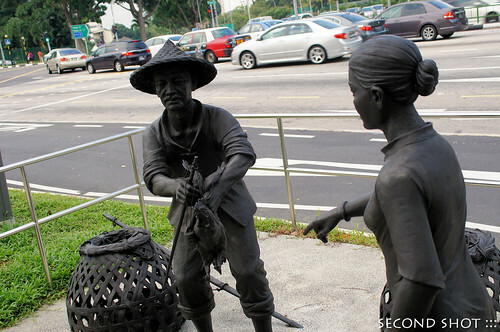 The bronze sculptures of a fowl seller and a lady buyer in samfoo along Upper Serangoon Road. They commemorate Simon Road Market? A bit misleading because the man, in straw hat, looks like a itinerant hawker with the transaction taking place outdoors. I'd expect the market to be sheltered at least. A market with 50 years of history before it was demolished in 1999, it was known for its delicious Mee Rebus and also Hokkien Mee and Pork Congee. Read this plaque beside the sculptures, which tells us there was even a "Muah Chee Stall where customers were even provided free tea to drink", and where many of the stall holders continue their business today at ... where else but Hougang. Speaking of Au Kang (Hougang before pinyinised), this was one place the catch from the vicinity of Kang Kar and Serangoon River were brought in, and attracted many from the neighborhood. 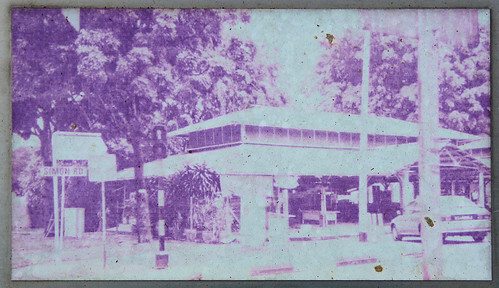 Simon Road Market (西门路市场) photo from the plaque. I shot this for comparison. The same location today. 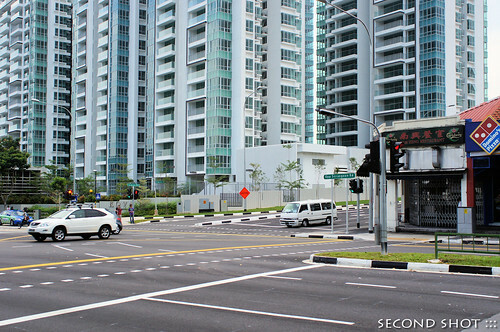 Simon Road, much widened, and Kovan Residences in place of the market. From the old photo, I think the market was on one side of the carriageway. If location is everything, then this bygone market at 6th milestone Serangoon was at one pretty strategic place because this is where Tampines Road meets Upper Serangoon Road. The market would have served the folks going to Punggol and Kang Kar or, using Tampines Road, to Changi. 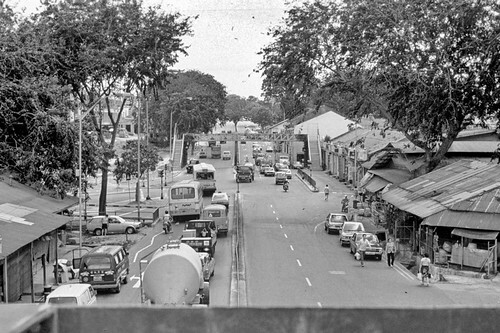 From old street directories, Tampines Road met Upper Serangoon at an acute angle, a V-shape, and unconnected to Simon Road; today Tampines Road forms a cross junction with Simon Road and Upper Serangoon. My personal memories of the place was when we used Tampines Road to visit my grand-dad living, or rather interred, somewhere inside the many private estates tucked between Upper Serangoon, Hougang Ave 2 and Yio Chu Kang Road. I was familiar with Tampines Road as we used to go but not very often to, I think, the market at Kovan for food. After the long and straight Tampines Road, we would reach a junction; after that a few confusing turns before reaching our destination. When I sat behind the wheels later, I was given directions and assurance, " just travel to the end of Tampines Road and go straight" and the guiding would start after the junction. After the visit, we would take to Yio Chu Kang Road and exit somewhere near the Japanese cemetery. Thus Simon Road would have been part of our route. I cannot recall whether I saw the market then but I'm pretty sure there was no condo. 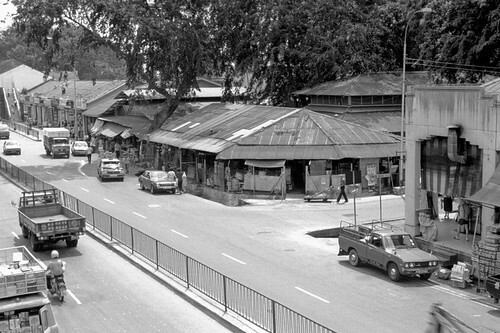 Before my exploration in June 2011, I found some old photos of Upper Serangoon Road at vicinity of Simon Road market (leave a comment if you know the photographer). Gosh, I'm overawed by how much the place has transformed! Upper Serangoon Road in city direction. Simon Road market is at first side road on right. Tampines Road on the left before the overhead bridge. A similar view today. 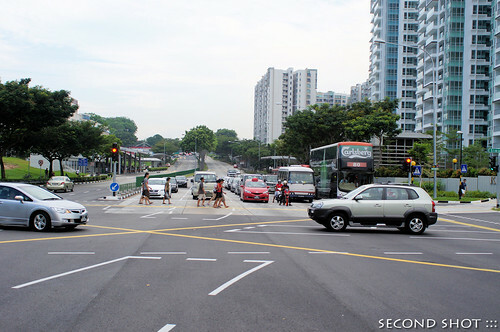 I believe Tampines Road was realigned slightly and Simon Road much widened after the market was demolished, with the result that both roads now meet at the cross junction. Kovan Residences at right foreground. Entrance of Simon Road showing the market. I'm not sure if the market includes the zinc-roofed shops fronting the main road. One good news: the coffee shop opposite outlived the market. A similar view today. 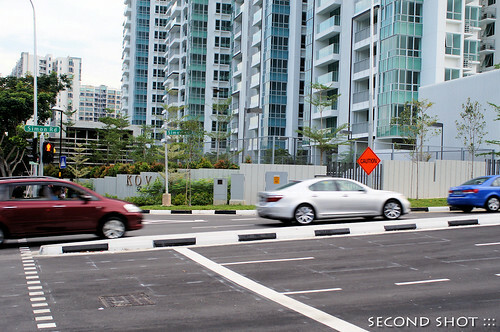 Evidence that Simon Road was recently widened. Note the same coffee shop at the corner. I wonder if this coffeeshop still has the vendor selling Fried Hokien Mee. It was one of the last Hokien Mee stalls, as far as I know, to use a charcoal fire. It was always an amazing sight to see the sparks flying from the charcoal fire when fanned. Wow Hokkien Mee over charcoal fire?!! I never tried that. Alas, forgot to take photo of the coffee shop; it was closed that day. I hope they have taken more pictures of the old market. It is a great part of the history of the place. It will be great to display those pictures in the condo lobby. Agree with Apartment. 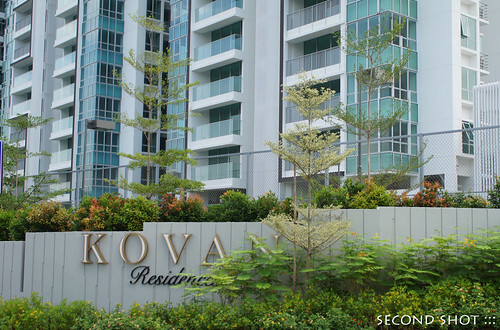 It is a pity the market has to make way for the condo. IMHO, we have too many condos in sg. I used to stay in a kampong village at the opposite side of the market when I was little. If you can get hold of a 70s street directory, the road is called Lorong Basapah. The village site is now where the nursery and Kovan Hawker Centre sits. A lot of the 2-storey shophouses are still there today. I remember fondly that there is this old fashioned toy shop next to the overhead bridge along the same row as the old market. My usual haunt is the mama shop outside the market coz of the comics they sell. not to forget the nearby Simon Road Camp also replaced together with Simon Road Market..
btw the old kopitiam was demolished a few week ago.. Thanks for the info on Lorong Basapah. My hunch is that the person had to do with the Basapah family who started Punggol Zoo and owned the estate of Somapah in Changi. Will check out the area again, thanks. Where Tampines Road meets Upper Serangoon, the confluence, must had been a significant area. I see, good to know they only renovated not demolished. Will go back if I have the chance. Thanks! My fondest memory about Simon Road market was that I went there in the mid 70s to buy some chicks to rear as pets. Simon Road used to be only a two-carriage street (and it was only one-way in) before the condo was built. Hi Anon, thanks for the memories. Most of us forget the chickens we eat but not the chicks or any animals we rear as pets. For those interested, see my photo for evidence of Simon Road widening. Hello Icemoon, i vaguely remember this stretch before Kovan MRT, the Condominium and all the other stuff along this stretch of road was redeveloped. The Simon road kopitiam has changed owners only recently, I believe just before your posting of this article. I do not know where the Hokkien mee has moved... but the Fried Oyster stall has moved to the Punggol Nasi Lemak kopitiam down the road just a bit. Hi Fabian, thanks for the information on the kopitiam. I miss the scene a decade ago when Simon Road was still one way. Hi guys, the Nam Heng coffee shop hokkien mee hawker is still in the same location, just that the coffeeshop is now newly revamped. Do visit him again. Hi Min, thanks for the information. Will drop by at Kovan one day to try the food. Hi Anon, glad that the post invoked your memories. Cheers. The Fried Hokkien Mee using charcoal fire from Simon Road Market is called Nam Sing Fried Hokkien Mee. It has shifted to the Old Airport Hawker Centre since the market was demolished. If I am not wrong, the Fried Hokkien Mee from the Nam Heng Kipithiam has also shifted to a Kopithiam at Kovan (Opposite the OCBC Bank Branch. There was a small eating place, coffeeshop, like a shed, with stalls selling fishball noodle and char Siew rice in between the curved junction of Tampines Rd and Upp Serangoon Rd. It's like in between Lorong Basapah and Kovan Market. And yes, I rem the shop that sells chicks outside Simon rd. There was a chinese temple called Poh Kiu Siang Tng along Simon Lane too. Thank you thank you so much these fond memories. My parents still live there and change is inevitable. I remember taking photos(For report books IC passport etc) in one of the shops on the second floor. I always buy my stationary from “天天书店”, a family business. The mama shop sells all kinds of things. Till now once in while i still dream of the place. Fantastic blog that revived many memories. Anyone knows where the fishball noodle stall moved to if they are still operating? They also sell at lim ah pin at one time but moved after the coffeeshop was sold.